When working outdoors in tough industrial conditions, every step has to be right! With the safety shoe range POWERLINE Stabilus is a reliable “partner” for outdoor work on uneven surfaces. Robust, safe, comfortable – POWERLINE’s three main qualities. The standard toe caps and reflective stripes ensure optimum safety when working in industrial, manufacturing or provision of services conditions. Walking around outdoors on uneven surfaces increases the risk of tripping over. POWERLINE helps to protect against this with its wide PU soles with raised sides to support the joints; this offers stability while still providing the highest levels of flexibility. 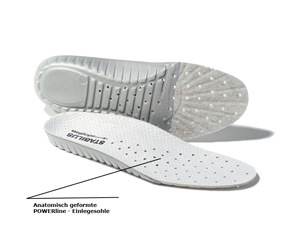 The rugged profile of the sole is self-cleaning and is particularly nonslip, with a profile depth of 5 mm. The intelligent POWERLINE interior combines optimum support and cushioning for the foot with maintaining a comfortable environment. The ergonomic leather insole, with its high level of perforation, ensures long-lasting sweat absorption. The Air-Tech fleece is washable at 30 degrees and is anti-bacterial. An air channel system on the reverse of the sole ensures optimum circulation of air. The areas in the middle and back of the foot are also encased in a flexible foam that ensures an optimum fit.